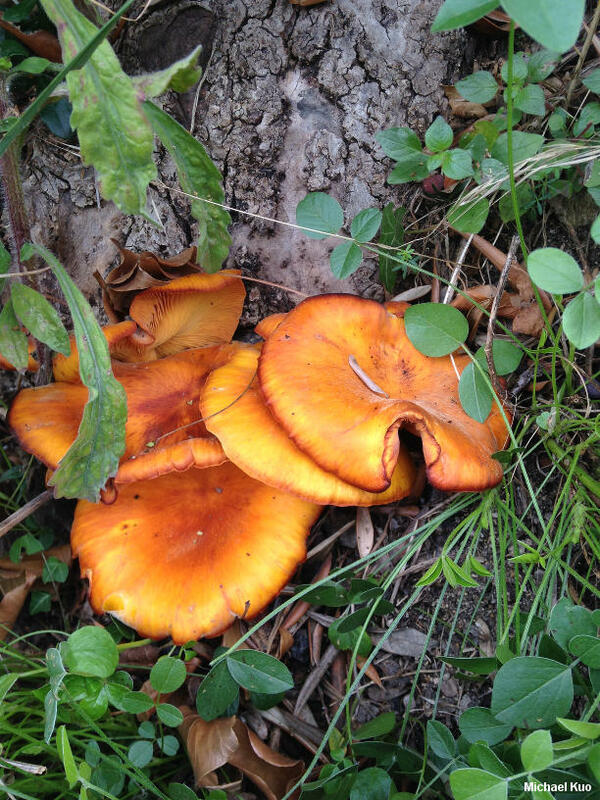 This strictly European "Jack O'Lantern Mushroom" is found growing in clusters in central and southern Europe, especially along the Mediterranean coast, decomposing the deadwood of oaks and olive trees. 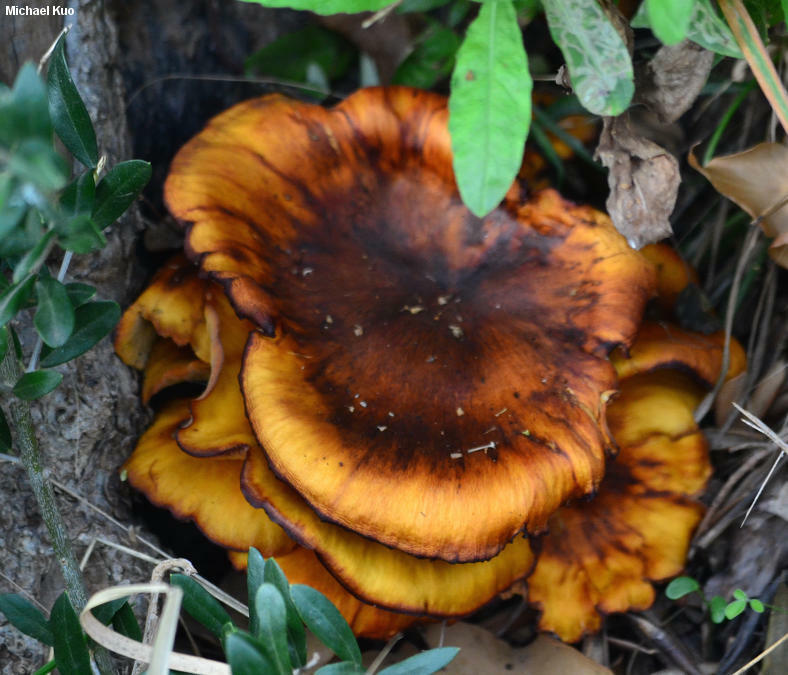 It usually features a bright, brownish orange cap, but colors range from nearly red to nearly brown. 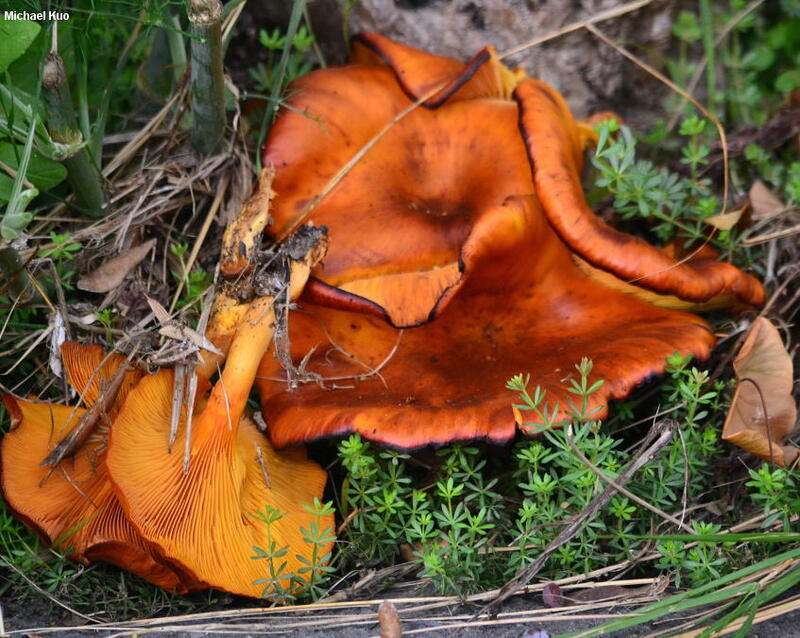 The gills run down the stem, and are usually a paler shade of orange, as is the stem. Omphalotus illudens is very similar, and can be found in central and northern Europe (as well as eastern North America); its cap is usually more orange--but the definitive way to separate it from Omphalotus olearius is with a microscope: Omphalotus illudens features smaller spores and frequent refractive hyphae in its pileipellis. 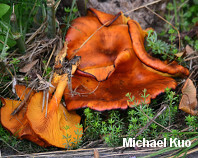 The name "Omphalotus olearius" often appears in older North American field guides--but evidence from mating studies, morphological studies, and DNA studies (summarized nicely in Kirchmair & Pöder, 2002) supports reserving the name olearius for the species described here, and using illudens for the eastern North American species. Ecology: Saprobic; growing in large clusters on the stumps or buried roots of hardwoods, especially oaks and olive; late summer and fall; central and southern Europe. The illustrated and described collection is from Italy. Cap: 4-12 cm; at first broadly convex, but soon becoming shallowly to moderately depressed; not usually featuring a central bump; bald; dry or slightly greasy; bright brownish orange to yellowish orange--or in some collections reddish orange or nearly brown; the margin slightly inrolled when young. 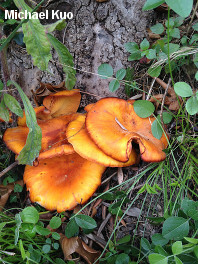 Gills: Running down the stem; close; orange; with many short-gills; luminescent when fresh. Stem: 3.5-9 cm long; 1-2 cm thick; tapering to base; solid; bald; pale orange to orange. 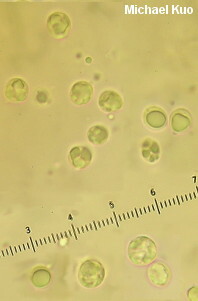 Microscopic Features: Spores 5-7 x 4-6 µ; sublacrymoid to subglobose; smooth; hyaline to yellowish in KOH. Hymenial cystidia absent. Pileipellis a cutis of clamped, cylindric elements 5-10 µ wide; green in KOH. Refractive elements not found in the pileipellis and subpellis. REFERENCES: (de Candolle, 1815) Singer, 1948. (Fries, 1821; Moser, 1983; Nonis, 2001; Kirchmair & Pöder, 2002; Kirchmair et al., 2002; Kirchmair et al., 2004.) Herb. Kuo 10161402.